To that end, compared to 2018, the sector must earn an additional 1.5 billion USD in export revenue, said Vice Director of the Department Le Van Duc at a conference in Hanoi on January 9. Le Thanh Tung, another Vice Director of the department, said that 1 billion USD is expected to come from fruit, and the rest from other products such as cassava, industrial plants, and mushrooms. The most promising fruits with high export revenue include lemon, mango, grapefruit, longan, and rambutan, according to Tung who stressed the need to enhance the productivity of farms and expand the market. Nguyen Quoc Manh, head of the department’s Division of Industrial Plants, said that it will be hard to met the goal of 16-16.5 billion USD in exports of industrial plants’ products this year as 2018 was a bumper crop year for almost all plants. During 2019, the sector must maintain the same output as 2018, said Manh, showing his optimism as the majority of industrial plant farms have been under harvest. Addressing the event, MARD Deputy Minister Le Quoc Doanh said that the outstanding results of 2018 is a challenge for the sector in 2019. He asked the sector to continue the reform process while focusing on developing major products such as rice, cassava, peppercorn, and cashew. Localities should reorganize the production of farmers towards larger scales, and closer connectivity both among farmers and between farmers and businesses to form a production chain, he said. Doanh also asked for research into better plant varieties; the strengthening of mechanization in production and harvest; as well as the application of high technology to enhance product quality, food safety, and the satisfaction of sustainable production standards. In 2018, the cultivation sector’s production value hit 482 trillion VND, up 2.52 percent year-on-year, with the export revenue of agricultural products reaching 19.5 billion USD, a rise of 3 percent over 2017. Changes were seen in the structure of cultivation, with a drop of 138,000ha of rice farms and 60,000ha of maize farms, along with an expansion of 48,000ha of fruit plants, and 23,000ha of vegetable farms. Despite the reduction in rice growing area, rice output still reached 43.98 million tones, about 1.22 million tonnes higher than that in 2017. 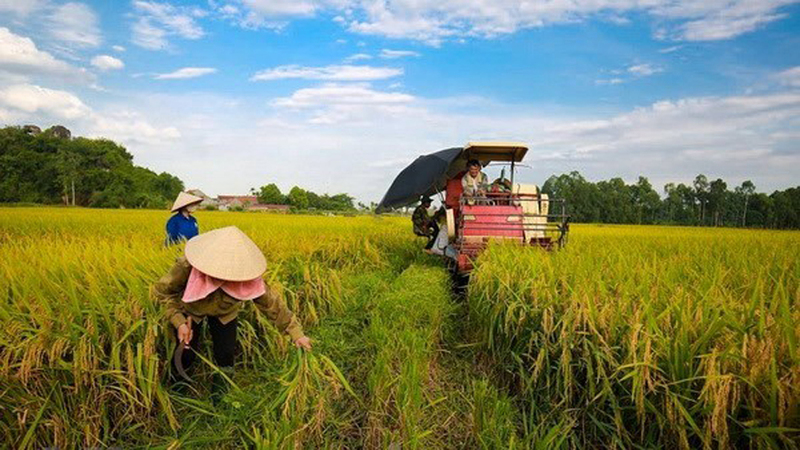 (BGO) – In 2018, Bac Giang province boosted up switching the crop structure that closely attached to build hi-tech farming models, expand production areas under VietGAP and GlobalGAP standards so as to improve the quality and competitiveness. The Australian Government-funded “Integrating gender in agricultural value-chain research” project looks to settle gender social constraints, encourage ethnic men and women’s involvement in agricultural value chains, as well as promote the adoption of high-tech application towards a sustainable agriculture.